APS Faridkot has announced recruitment notice to hire candidates for the posts of PGT, TGT & PRT and non-teaching posts. This is the greatest news for candidates who are looking for Latest Teaching Jobs in Punjab. 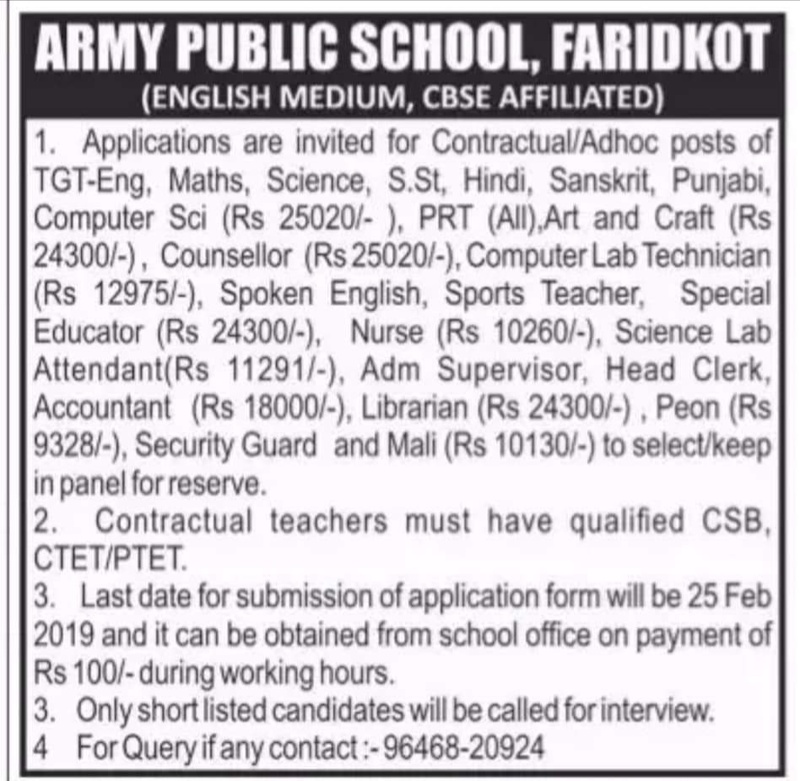 They can apply for the Army Public School Recruitment 2019 at Faridkot. The official notification is already uploaded on our site. The applicant may check thoroughly before applying. Eligible and interested candidates may submit their application form till 25th February 2019. Further details regarding vacancies, education and other are given below. Qualification: As per govt norms. Graduation with the relevant subject. Age Limit: Upper age limit should be 40 years for fresh candidates & 57 years for experienced candidates. Selection of candidates will be based on the performance in followings. Application fee: Rs.100/- in form of Demand Draft in favor of Principal, APS Faridkot submit to school by hand. Interested and eligible candidates may submit their application form on or before 22.02.2019 to the school address by post/hand/courier along with self-attested copies of all the testimonials and demand draft. I am art and craft teacher..my qualification .2 year diploma art and craft..fine art with b.a add on course..and post graduate fine arts..